I'm going old school today. It's summer, and some nights I simply like to sit up all night and read just because I can. Those nights it's fun to pull out an old friend, something that's been on my shelf for years. Something I can remember the characters because they've stayed with me, maybe even a few highlights, but the details have grown fuzzy enough for me to enjoy a reread. Nothing But Trouble fulfilled that bill. Here's a short blurb, and we'll chat on the other side! It's not fair to say that trouble happens every time PJ Sugar is around, but it feels that way when she returns to her home town, looking for a fresh start. Within a week, her former teacher is murdered and her best friend's husband is arrested as the number-one suspect. Although the police detective investigating the murder—who also happens to be PJ's former flame—is convinced it's an open-and-shut case, PJ's not so sure. She begins digging for clues in an effort to clear her friend’s husband and ends up reigniting old passions, uncovering an international conspiracy, and solving a murder along the way. She also discovers that maybe God can use a woman who never seems to get it right. This was the first in a three book series and I immediately fell in love. PJ Sugar was a fun, well-rounded character who's wit and charm made me not only like her, but laugh and cry with her. Each book has its own mystery and even forward movement in PJ's life as she tries to figure out who she is...where her worth comes from...can she ever walk out of her past? Surrounding PJ are wonderful secondary characters who keep you entertained as well. Between her sister's Russian in-laws and PJ's old friends, there's enough moments that have you shaking your head--in a good way. All together this series of books has stayed on my shelf and will continue to for years to come. 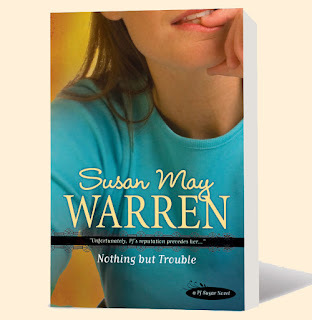 I'm sure it's one I'll pull out on another long summer night simply to enjoy:) You can purchase Nothing But Trouble here and look into the next two books, Double Trouble and Licensed for Trouble while you're at it. Thanks for sharing. Sounds like a good story.